Capt Sloan: used for isolating diseases and cultures. Mm hmm well that makes sense. You can’t have one! It exceeds your MEE, minimum essential equipment, it would be a luxury. Capt Sloan: oh those I can let you have! Just cross out howitzer and insert pizza oven! 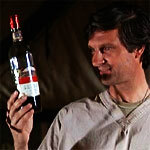 Flagg (Halloran) to Klinger: hey up close you’re a Man..
Frank in Father Mulchay’s tent: Father. Dear Father. Father dear farther come home with me now. Silly Goose. Blake to Frank: you’re always wrong Frank. That’s what so right about you. The classic rant from Adam's Ribs S3E11. Great writing and delivery. Hawkeye: "I didn't hear you say that. Because it isn't possible. It's inhuman to serve the same food, day after day. The Geneva Convention prohibits the killing of our taste buds!" "I simply cannot eat the same food every day! Fish! Liver! Day after day! I've eaten a river of liver and an ocean of fish! I've eaten so much fish, I'm ready to grow gills! I've eaten so much liver, I can only make love if I'm smothered in bacon and onions!" A food riot ensues in the mess tent which finally lives up to its name and Henry gives Hawkeye the 3rd degree and a lecture as Hawkeye leans his head against the skeleton in Henry's office. Henry: "Just who do you think you are, Pierce?" Hawkeye: "I broke under the pressure, warden." I’ll take 20 and a quart of sauce! Col. Blake: Did you guys really send a case of pipe cleaners to McArthur?! Gen Barker: well capt...what ru going to do now? Gen Barker: capt Pierce! Your in a whole lotta trouble now!! Hawk: I don’t think so...I can beat a pair of 10s !! MASH means Mobile Army Surgical Hospital, and mobile you shall be! Sir, that'll mean tearing down the tents, the buildings. We'll have to pack everything up. I mean, we've been here a long time. We fixed it up so nice. I mean, gee whiz, just last week the nurses planted radishes. "A radish will never stand in the way of victory." -Marshal Foch. "I have to take my milk of magnesia, and do 3 push-ups..."
I gave a discharge to a sheep! He's on his way to Tokyo now. A buddy of mine will reroute him to Iowa to my folks. I already radioed them. They're expecting him. He can sleep in your room. Your pants will just fit him. I've got Command on my tail! And a hospital full of Greeks waiting on a lamb that's on a plane on his way to Iowa to become Radar's little brother! - Bartford Hamilton Steele, that’s 3 e’s not all in a row! When you get home, would you call my wife? - Certainly, General. - Tell her I'm sending a Jeep for her birthday. It'll be in a large crate marked "kitchen utensils.
" Don't mention that in your article. You might also tell Mrs.
Steele the dried prunes are working out fine. Best thing since the Gatling gun. As a matter of fact, just talking about it Uh, excuse me, where's the little generals' room? Oh, that's just outside, sir. Col. Sherman T. Potter: [after Frank shot BJ in the leg] Burns, what's the meaning of this? Maj. Frank Burns: I was cleaning my gun and it discharged prematurely. Sir, I think the Chinese have captured Maj. Houlihan. Henry: "Will you stop saying what I am thinking?" Radar: "One of us has to." Radar (reading a letter Flagg dictated to him): "Mary had a little lamb. Stop. My dog has fleas. Stop." Flagg: "Good. There's a bit more. Mairzy doats and dozy doats, and I'll be home for Christmas. You got that?" Radar: "Just a moment, sir. OK."
Flagg: "Sign it 'Your loving son, Queen Victoria." Hawkeye: "Mary had a little lamb." Pratt: "He knows I'm here." Hawkeye: "I hate to tell you this, Mary, but your dog has fleas. Hawkeye: "Dear Dad, I am not dead. Stop. Hope you are the same. Stop. Thinking of selling my clubs? Stop. Spending my insurance policy? Stop."